New York, NY, January 09, 2019 --(PR.com)-- The research papers, titled, “Efficient autotrophic denitrification performance through integrating the bio-oxidation of Fe(II) and Mn(II),” “Comparison of denitrification performance by bacterium Achromobacter sp. A 14 under different electron donor conditions” and “Effect of mixed electron donors on autotrophic denitrification by Pseudomonas sp. SZF15” were written by Junfeng Su. The three papers derive inspiration from an issue that has reached an alarming stage. Environmental pollution, a serious problem on a global scale. All three papers deal with nitrate removal from groundwater. Groundwater is widely used as drinking water. In most cases, groundwater from anoxic acquifiers contain excessive levels of iron, manganese and/or nitrogen. Nitrate-nitrogen contamination has become an environmental and a public health issue in most developed and developing countries. It is often seen that nitrate contamination causes a rare disease called methemoglobinemia when ingested by infants. It may also cause carcinoma, malformation and mutation when transformed into nitrosamines. A large amount of nitrogen is also discharged into the aquatic ecosystems thus leading to severe deterioration of water quality. A study showed that approximately 10-25% of the groundwater in the US was contaminated with nitrate. It was seen that the condition was worse in some developing nations. Drinking contaminated groundwater or its use in irrigation can lead to serious health issues. 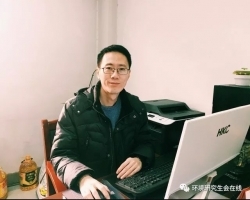 Junfeng and a team of researchers analysed such data and decided to develop a novel, facile and an efficient approach to remove nitrate from the groundwater body. In the paper titled, “Efficient autotrophic denitrification performance through Integrating the bio-oxidation of Fe(II) and Mn(II),” according to Junfeng and the team, high concentrations of Fe(II) and Mn(II) which co-existed in the natural groundwater body, could be easily oxidized as the electron donor. Junfeng and the team proposed a novel and efficient strain Pseudomonas. sp. H117-based bioremediation process. Furthermore, the kinetics and parameters about substrate (nitrate) and substrate self-inhibition (nitrite) were obtained. The results showed that the Edwards model used by the team suited their experimental data. It was also assessed that Fe(II) and Mn(II) could be formed to biogenic Fe-Mn oxides (FeOOH and MnO2) via microbial oxidation. In the paper titled, “Comparison of denitrification performance by bacterium Achromobacter sp. A 14 under different electron donor conditions,” Junfeng Su mentions the use of heterotrophic, mixotrophic and autotrophic denitrification in the treatment of nitrate-contaminated water. While conducting the study a newly anaerobic denitrifying bacterium, A14, with high denitrification and Mn(II) oxidation ability was isolated from sediments. This process made his study easier. It exhibited efficient denitrification ability in all the three mediums viz., autotrophic, mixotrophic and heterotrophic. Furthermore, the meteorological chromatography findings suggested that N2 and N2O were detected in the gas produced by strain A14. It was also concluded that the characteristic of gas composition varied in different mediums. In the paper titled, “Effect of mixed electron donors on autotrophic denitrification by Pseudomonas sp. SZF15,” a mixed electron donors of Mn(II) and Fe(II) were tested for their effects on autotrophic denitrification. Complete nitrate removal was found at high Mn(II)/Fe(II) molar ratios, 30 °C, pH 7.0, and an electron donor/electron acceptor molar ratio of 3.00.Furthermore, In addition to the above, the findings showed that nitrate could be converted to nitrite and further be degraded to N2 by nitrite reductase (nirS). This research is pivotal as it deals with one of the most important natural resource, groundwater. Groundwater is what humans rely on in some way or the other. Hence, it should not be exploited and any contamination must not be overlooked. The study conducted by Junfeng Su can encourage environmental researchers and the government of various countries to save this vital resource. The three research papers by Junfeng Su can play a pivotal role in saving the environment.